Join the Anti Raids Network and the London Campaign Against Police and State Violence to watch and discuss Ken Fero’s documentary Justice Denied. Fero follows the stories of Joy Gardner, Kwanele Siziba and Joseph Nnalue, three people who died in connection with immigration controls. On the 28th July 1993 Joy Gardner died when police and deportation officers used force to restrain her, tying her with a body belt and ankle straps and gagging her mouth with thirteen feet of tape. There was a national outcry when people heard how Joy had died. ‘Justice Denied ‘ hears from members of her family about Joy’s death, reports on the reactions to it in the Black community, examines two other deaths related to immigration control, that of Kwanele Siziba and Joseph Nnalue, and asks what are the political circumstances that allow these deaths to happen. The film follows the struggle of Joy’s family in their fight for justice and for the truth to be exposed. The film examines how the media carried out a character assassination of Joy in order to justify the way in which she was killed and how this fed into a widespread cover-up.The highly controversial documentary asks why senior police officers and the immigration service did not face charges for their involvement in this controversial incident. Throughout ‘Justice Denied’ the families speak out to keep the memory of their loved ones alive, to demand justice and to challenge the climate of fear created by Britain’s enforcement of immigration controls. Sunday 15th June, 2pm – 4pm – at Unit 8, Warwick House, Overton Rd, London SW9 7JP. Have you or someone you know been stopped and searched by the Police? Want to know what your rights are and how you challenge unlawful behaviour by police officers? London Campaign Against Police and State Violence are offering experience and training on what to do and what your rights are on stop and search. 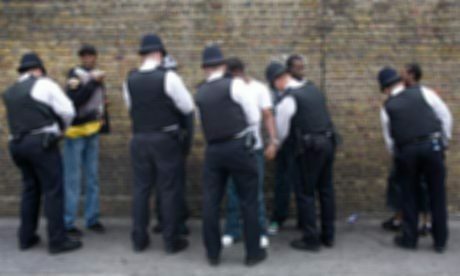 A recent study by Police Inspectorate showed that 25% of stop and searches carried out were unlawful. Two years ago this arrest with sickening force was filmed in Brixton, we want to stop aggressive and unlawful checks from being carried out. LCAPSV wants to reduce the abuse of Stop & Search in Brixton and will be organising police monitoring groups in the near future. If you want to get involved, want to be able to spot unlawful police behaviour or just want to know what to do when you or a friend is stopped by the police. This training will help.